Y’all (I don’t even say y’all that much but this post’s urgency calls for a y’all), I need your help. You may be enjoying a fabulous summer vacation but I have a bag dilemma and need your brains now! 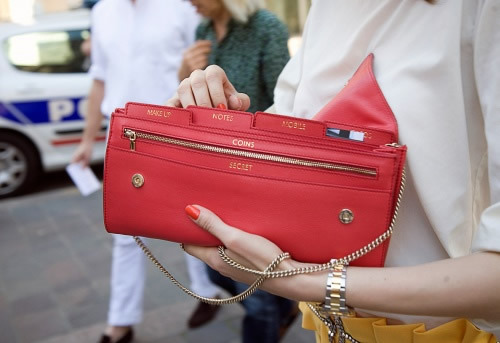 After stumbling upon this photo that StreetPeeper took for Vogue, I have been wracking my brain attempting to figure out precisely who designs this clutch. Upon first glance, Smythson came to mind as everything about this organizational clutch screamed Smythson. But after contacting the brand about this bag, they told me they make similar travel clutches but this is not theirs. This bag is a statement piece that I am currently coveting. Can any of you help to Name that Bag!? Having a week that feels like it is dragging on? I know I am, also being sick does not help the week to fly by. Time for another rendition of Name That Bag. Can you figure out what bag is being featured above? TGIF! Welcome to our next puzzle in our Name That Bag category. 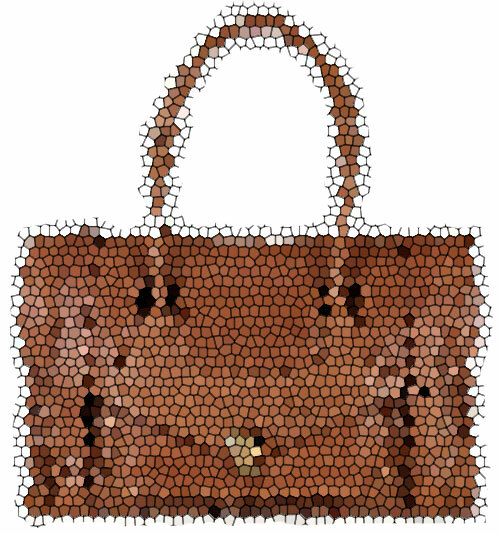 Rather than a chopped up and mixed up puzzle, we decided to give this bag a mosaic touch. We will update the post tomorrow with the bag name and where you can buy it. Take a look and start your Friday off with a fashion brain-teaser. Name That Bag! 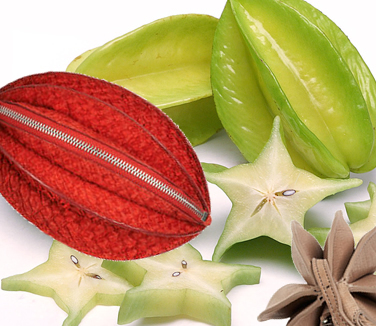 What bag closely resembles star fruit? Sometimes an accessory design catches our eye and reminds us of something other than arm candy. And that is precisely what happened to me when I saw these shoulder bags. Dimensions are larger than a star fruit (4.5″ x 8″), but seriously the entire design is completely reminiscent of the tropical fruit. In fact, from every angle I am certain I am looking at the star fruit’s leather cousin. It is time for you to put on your handbag thinking cap and tell me if you can Name that Bag! Click to find out! Looking for a little fun to get over the mid-week hump? Take part in our Name That Bag game! 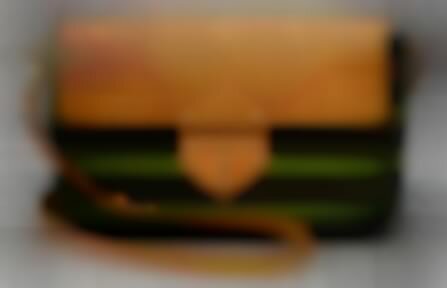 We are bringing back an old favorite category with a twist, we have chopped a handbag image for you all to identify! We will update this post tomorrow afternoon with the actual bag image. We are starting off with an easy one, so take a look and tell us who makes this bag and what bag it is in the comments section below. Alright everybody, it is time for you to Name That Bag! I’m always a tad bit embarrassed when I can’t identify a bag. I spend 40-plus hours a week contemplating purses, and at a certain point, I feel like I’ve seen almost every handbag that the fashion world has to offer. Just when I get comfortable in that feeling, some handbag always comes along to knock me off my high horse. This time, that bag is being carried by Kelly Rowland. A friend sent me this photo from La La Vazquez and Carmelo Anthony’s wedding over the weekend, at which Rowland was a guest. My first inclination was to say that the bag is yet-to-be-released Louis Vuitton, but then I thought better of it. My friend’s guess was Chloe, but that doesn’t seem quite right either. If you have information on this bag, please let us know in the comments. Click the picture above for a closer look. Psst…if you like her shoes better than her bag, they’re Yves Saint Laurent Tribtoos. Kate Hudson is in the spotlight again. This time it is not for being in another RomCom (romatic comedy), but because of the man she is reportedly dating, Alex Rodriguez. We have a full review of her look on Bag that Style, but I can not get her clutch off my mind. Problem is I have a clutch on my mind that I can not identify. So for a pre-thanksgiving present to me, who can help Name that Bag! Olivia Palermo Style: Name that Bag! Every single aspect of this look I adore. I have to admit, Olivia Palermo is one of my new favorite people. Whether she has a stylist or not, nearly every time I see her she has her outfits perfectly put together. Her evening wear is typically elegant and spot on and her day time wear is uptown chic. Take this outfit for example. Olivia takes casual chic to a whole new level, pairing her J Brand Skinny jeans with a jacket that I must have (anyone know who makes it??) and her signature amazing wavy hair. The handbag is the perfect finisher. We need to know who makes this bag. 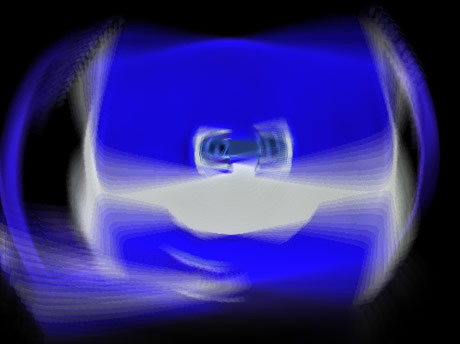 The time has come to give out virtual cookies. A virtual cookie for the person who can Name that Bag that Olivia Palermo is rocking! This week on Bag that Style we had a great array of celebrities with their handbags. But we were stumped on a few designs, so maybe you can help us out!